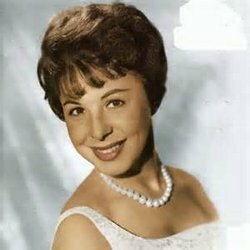 Eydie Gorme, the singer who both performed solo and with her husband Steve Lawrence, died 10 August 2013 at the age of 84. Eydie Gorme was born Edith Gormezano in The Bronx on 16 August 1928. She attended William Howard Taft High School, where future director Stanley Kubrick numbered among her classmates. After graduating high school, she took night classes at City College while working during the day as a translator at the United Nations. On the weekends she sang with Ken Greenglass and his band. Ken Greenglass would become her manager and she sang on tour with Tommy Tucker and His Orchestra. It was with Tommy Tucker and his band that she made her recording debut in 1950. She went onto perform with the bands of both Tex Beneke and Ray Eberle. It was in 1952 that Eydie Gorme struck out on her own and recorded her first solo work. That same year she was the star of the Voice of America radio show Cita Con Eydie ("An Appointment with Eydie"), broadcast in Latin America. Her big break would come in 1953 when she appeared on Tonight, then hosted by Steve Allen. Also booked on the show was another singer, the man would one day become her husband, Steve Lawrence. It was in 1954 that Miss Gorme had her first hit single. The song "Fini" went to #19 on the American singles chart. In the late Fifties she would have three more top forty hits: "Too Close For Comfort"(which went to #39 in 1956), "Mama, Teach Me To Dance" (which went to #34 in 1956), "Love Me Forever" (which went to #24 in 1957), and "You Need Hands" (which went to #11 in 1958). Eydie Gorme appeared regularly on television in the Fifties. In addition to Tonight, she appeared on Look Up and Live, The Denny Vaughan Show, Frankie Laine Time, The Big Record, The Dinah Shore Chevy Show, The Pat Boone Chevy Showroom, Perry Como's Kraft Music Hall, Person to Person, The Milton Berle Show, The Patti Page Oldsmobile Show, and The Steve Allen Plymouth Show. In 1958 she and Steve Lawrence hosted their own summer replacement show, The Steve Lawrence-Eydie Gorme Show. Miss Gorme and Mr. Lawrence were married in 1957. In the Sixties Eydie Gorme would have her biggest hit. In 1963 "Blame It on the Bossa Nova" went to #7 on the Billboard singles chart. Miss Gorme would have only two more top forty hits during the decade on the Billboard Hot 100, both duets with her husband Steve Lawrence: "I Want To Stay Here" and I Can't Stop Talking About You". Her songs regularly hit the Billboard Easy Listening chart, among them the singles "Can't Get Over (the Bossa Nova)", "Just Dance On By", "Don't Go To Strangers", "What Did I Have That I Don't Have? ", "Tonight I'll Say a Prayer", and so on. She also continued to appear frequently on television. Eydie Gorme and Steve Lawrence were frequent guests on The Garry Moore Show. Both with and without her husband, Miss Gorme appeared on such shows as Juke Box Jury, The Jimmy Dean Show, What's My Line, The Jack Paar Programme, I've Got a Secret, The Hollywood Palace, The Ed Sullivan Show, and The Kraft Music Hall. Eydie Gorme continued to regularly hit the Billboard Easy Listening chart in the Seventies with such songs as "Love is Blue/Autumn Leaves" (with her husband Steve Lawrence), "It Was a Good Time", and "What I Did For Love". She appeared on such TV shows as Here's Lucy, The Merv Griffin Show, Sammy and Company, Sanford and Son, The Tonight Show with Johnny Carson, and The Carol Burnett Show. She and Steve Lawrence appeared in their own television specials, Steve and Eydie: Our Love Is Here to Stay, Steve & Eydie: From This Moment On...Cole Porter, and Steve & Eydie Celebrate Irving Berlin. After the Seventies Steve & Eydie focused more on performing American standards. Eydie Gorme released no more singles, although they continued to tour and released several more albums. She continued to make occasional appearances on television, on such shows as Empty Nest, The Nanny, The Tonight Show, Fraiser, and The Rosie O'Donnell Show. She had a cameo in Ocean's Eleven (2001). Miss Gorme retired in 2009. Eydie Gorme was one of the most remarkable singers of the 20th Century. She had an incredible range, much greater than other female vocalists of her era. She was also very versatile as a singer. In her career she performed everything from swing to American pop standards to jazz. Often overlooked here in the United States is that Miss Gorme was a pop star in multiple languages. Fluent in both Ladino (the spoken by Sephardic Jews) and Spanish, she produced hit singles in Spanish, including "Sabor a Mí". Of course, it is impossible to separate Eydie Gorme from her husband Steve Lawrence. While they both had hits of their own, one always heard more about "Steve & Eydie" than simply one or the other. Together they were consummate performers, with an easy going presence on stage. In many respects they were a throwback to another time in the era of rock 'n' roll, a happily married couple who behaved as such on stage. It made for good entertainment even after the advent of rock music, and allowed for the two of them to not only have a marriage that lasted over 50 years, but a music act that did so as well. Both as a solo performer and one half of the team of Steve & Eydie, Eydie Gorme was a singular performer.